That famous scene of Scarlet O’Hara holding onto her bedpost to be strapped into a very tight corset turns many people off the idea of ever trying them. However, that is the extreme. 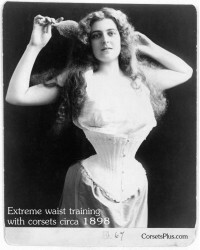 Corsets should be worn snug, but not “omg I cannot breath” tight. Only steel boned corsets should be considered for body modification or extended wear – plastic boning will break over time while the steel bones will probably outlast the corset fabric! And you can put them on yourself – though the first time you wear it, I do suggest having a friend’s help. There are several ways you can lace a corset – some corsets come already laced, some will come with the laces separate. We recommend lacing from top to bottom always starting inside the corset – see diagram. Create a loop at the waist point of the corset as shown to allow for easier and more even tightening, and put knots on each end to keep them inside the corset (don’t tie they together). This method lets you tighten the top and bottom sections separately to allow for comfort. Two shorter laces could also be used this way – just tie both in the center waist point. To put on a corset properly, loosen the laces so you can easily wrap it around your body and close the front (referred to as the busk and usually very sturdy hooks and metal eyes). Fasten the busk starting at the second hook from the bottom and working up closing the bottom last. Tighten the laces gradually – don’t do the Scarlet pull as this can strain and tear even the best, sturdiest of corsets or loosen the eyelets the laces go thru. Refer to the lacing diagram at left – you want to work the lacing towards the center so the bow is about even with your waist as this causes the least stress to your corset and allows you to breath. Work from the bottom to the center making the corset snug against the body and then from the top down finally tying into a bow at the center back. Do not tie the laces around to the front of the corset as this can damage the outer layer of fabric. You do not want to drastically reduce your ribs or hips as this will cause discomfort and do not worry about a gap between the sections of the corset in the back – that is normal (some corsets have a “modesty panel” that will lay under the laces to hide any skin). Over repeated wearings, your body and the corset will mold to each other letting your tighten it a bit more each time. Take your time and your corset will last for many years. To remove the corset, always loosen the lacing first before trying to open the busk or you risk straining the fabric (and your body!). Unfasten the busk gradually, further loosening the laces if needed. Bustiers, like most lingerie, can be simply hand washed (or machine delicate cycle) according to it’s label directions. Corsets, especially those with steel boning, are best dry cleaned as water can cause the steel to rust and show rust marks on some fabrics. You can take a damp (not wet) cloth to wipe down the lining after wearing to reduce cleaning – let it air out flat or inside out. A thin blouse or other garment under the corset will also help protect it from your perspiration and body oils, making required dry-cleaning less frequent. Both corsets and bustiers often have garters attached for stockings – most being removable (always remove them before cleaning). 0 Comments To "How to Lace a Corset"